Its a beauuutiful day outside today in Seattle and we are just loving it. 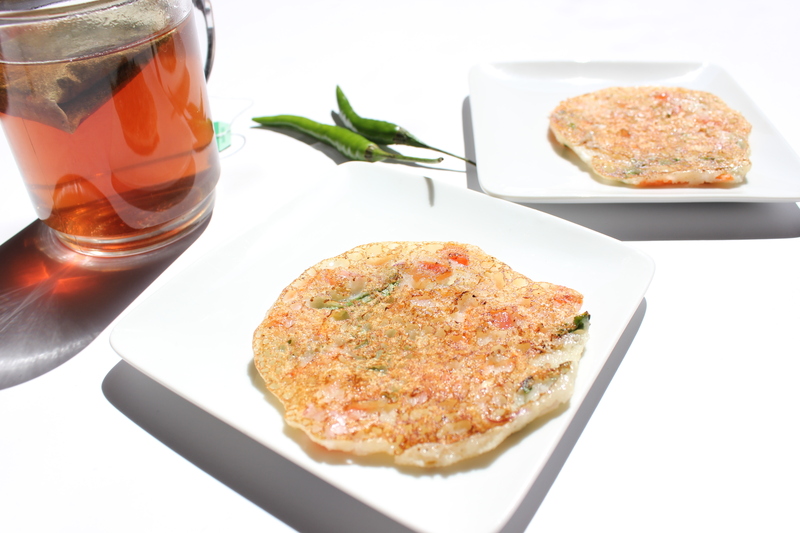 Before I fly away for biking along side a river, posting today’s breakfast recipe – Semolina Pancakes. A breeze to make, damn delicious and you can actually clean up your fridge by throwing in just any leftover veggies in them. 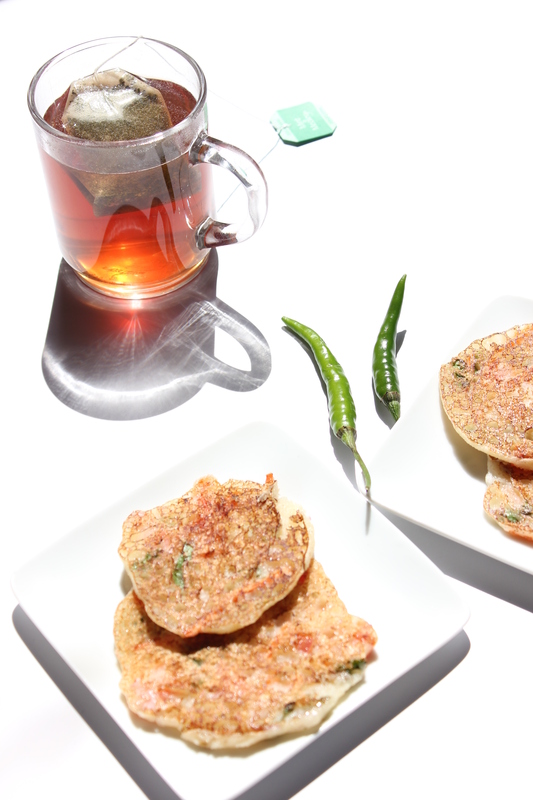 These little pancakes will keep you full for longer and is power packed delicious whole meal in itself with vegetables. I had them first time at my husband’s parents place. I am often short of ideas on what to have in breakfast on weekends, something fancy, something new. And these pancakes provided the perfect breakfast for us. I am sure they will be a frequent feature in my kitchen from now on. So, the next time you can’t think of what to cook for breakfast, try them! Enjoy them with tea or coffee. Have a good day! Mix semolina with curd and water. Add salt and pepper. Keep aside for 15-20 minutes. The more you allow semolina to rest, easier it will be to make pancakes. I allowed my batter to sit for 30 minutes before proceeding to next step. In the meanwhile, finely chop your vegetables. Add them to the semolina-curd mixture. The mixture will thicken after 15 minutes as semolina tends to expand when added with water. Heat a non-stick skillet and spray with cooking oil. When the skillet is hot, reduce heat to medium and drop spoonful of batter, shape it into a circle. It should be about 1/4 inch in thickness. Let it brown on one side for a minute before flipping it over. Take care not to touch when the batter is still wet, flip only when it looks a little solidified. Repeat the above steps till you have consumed all the batter. 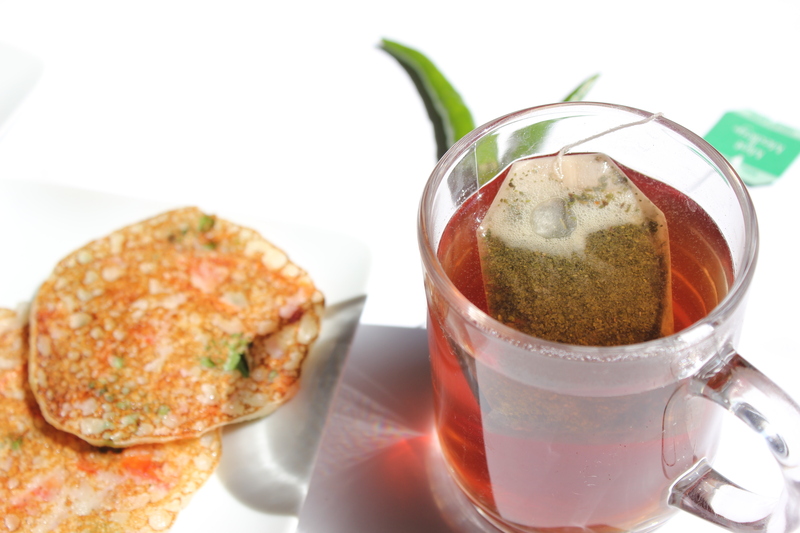 Serve hot with any beverage of you liking. Will they last till evening? And remember your promise.